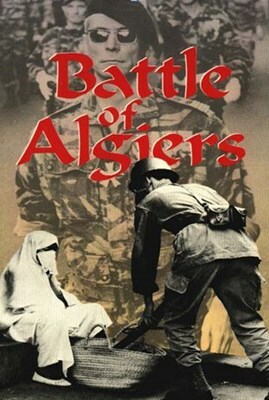 Battle of Algiers reconstructs the events which took place in the capital of French Algeria between November 1954 and December 1957, when the local population rose up against French rule. Guerilla tactics on the part of the National Liberation Front (FLN) leads to acts of increasing violence on both sides, which finally results in the deployment of elite French paratroopers in Algiers to smoke out and destroy the FLN leadership and quell the violence against the local French populace. This they do; but while the French may have decimated the core of the FLN, the popular uprising grows bigger and it becomes obvious that sooner or later, France will be forced out of Algeria. DVD-R is in French with switchable English subtitles. Approx. 121 mins. See film sample for audio and video quality!